Are you looking for a cool change in one of your home’s most relaxing areas? If so, then it’s about time to pick a couple of designs which should go well with your bathroom refinishing ideas. While you’re at it, you may also want to add functional accessories to ease the comfort in this area. To ensure you’ll have an exceptionally updated bathroom, you’ll also need to have a reliable refinisher on call. Thankfully, Chicago has a couple of top service providers who ensure only the highest quality of work done among properties. Upon beginning with your bathroom design, it would be great to pick some colors and accents which can make a visual impact in your interiors. Use the Color Wheel: This is the best place to start when choosing the perfect accent color scheme for your space. Complementary Color Scheme – Complementary colors are across from each other on a color wheel. This color combination reflects a more formal feel with separation of colors. Some examples are red and green, blue and yellow, or purple and orange. Analogous Color Scheme – Analogous colors are next to each other on a color wheel. An analogous color combination is more casual and reflects a more restful atmosphere. Some examples are yellow and green, blue and violet, or red and orange. Use Three Colors: The 70/20/10 Rule: This rule of three is as easy as choosing one neutral color, one rich color, and one accent color. To make this work, use the lightest color for 70 percent of the room’s décor, the second lightest for 20 percent, and the boldest for 10 percent. These create a design scheme that’s well-rounded in color. Back in Black: Experts agree that incorporating black will enhance all of the other colors in a room. The retro-themed kitchen featured below uses bold, custom floral mosaic tile wallpaper that extends the height of the wall, with white shaker-style cabinetry on either side of the hood. The black cabinets create a dramatic look while keeping the room classic and interesting. Neutrals: Neutrals can also be used as accent colors. Using varying shades of a neutral color can reflect a sophisticated and classic look without being dull. Here, a striking coffee-colored mosaic tile mix shower wall lends visual impact to the room while a coordinating bath mat and towels pull the room together. Upon placing splashes of colors in your bathroom for comfort and inspiration, you may also want to consider increasing the functionality in this area of your home. For instance, you may want to upgrade towards having a large bathtub or refurnish your old bathroom. Here are the things you want to know before deciding on refinishing your old bathroom to new and cozy bathroom style. If you think your bathtub is in need of refinishing, then there are a few questions that you need to ask yourself. 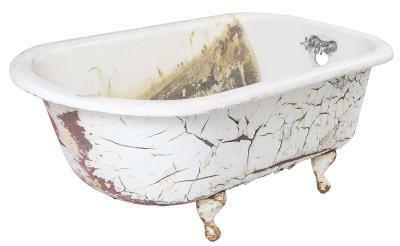 The old way of bathtub refinishing has given way to the new age of refinishing. This new age of bathtub and bathroom refinishing ideas simply involves cleaning the surface with a heavy duty cleaner, applying an adhesive material which will create a molecular bond between the bathtub surface and the new glossy finish to be applied. This way of refinishing is a lot faster and in my opinion has a much better track record for non-failed bathtub finishes. Budget Refinishers is known to breathe in some new life into old, moldy bathrooms. Even other aspects of the home can also be refinished or redesigned to suit more of their clients’ styles. Lastly, they surely make sure to do their work exceptionally, without ever cutting corners. Looking for bathtub refinishing chicago? Contact us today. We refinish and repair all kinds of bathtub and tile refinishing services.